The first White Sox homestand of the 2011 season came to a close this past Sunday, and counting my “warm-up” game April 5th between the Cubs and Diamondbacks that meant my stretch of 11 games in 13 days would be coming to an end. Nothing like getting the season started with the pedal to the metal. No complaints, though. Baseball has been and continues to be very, very good to me. 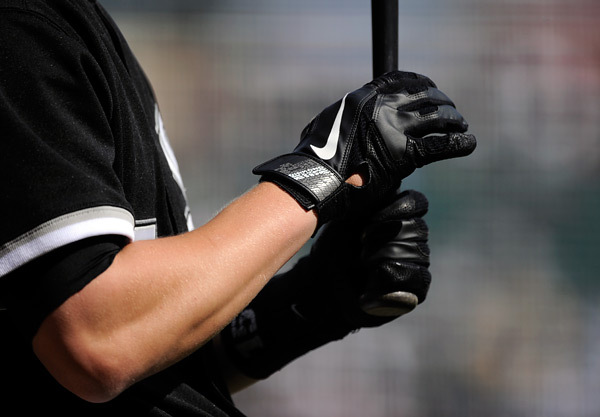 Gordon Beckham loosens up in the on-deck circle during a recent game between the White Sox and Rays. The excitement of covering Opening Day (come on, why hasn’t Opening Day officially declared a National Holiday??) can sometimes be overshadowed by a few early season growing pains. Specifically, it’s getting back into the flow of my workflow. Shooting is the easy part. I live by the motto work smart, not hard. Fine tuning workflow to that end is critical if you plan on keeping up during the long baseball season (without driving you and your loved ones crazy), especially after working 11 games in less than two weeks. No time to put off till tomorrow what you can accomplish today, right? Those games aren’t going to edit themselves, as much as you wish they would. Photography workflow is a topic deserving of its own blog, so rather than get into details here I think I’ll discuss the importance of efficient and effective workflow in the near future. As some of you know, besides being the Chicago White Sox team photographer I also work for various MLB licensees as well as MLB Photos, so I occasionally make the trip up to the north side of Chicago to work out of Wrigley Field. Yep, the White Sox team photographer working out of Wrigley Field! I like to jokingly remind my Sox fan friends that it’s different for me since I’m getting paid to be there! Wrigley was the destination as I made my 2011 season debut April 5th as the Cubs took on the Arizona Diamondbacks. I was happy to get back into the swing of things (pun intended) prior to the White Sox Opener on the 7th. Nothing like a little warm up to get ready for the main event. The Cubs and Diamondbacks match-up proved to be an uneventful game picture wise but the weather certainly cooperated. Jeff Baker of the Chicago Cubs is upended by Juan Miranda of the Arizona Diamondbacks while recording a force out on April 5, 2011 at Wrigley Field in Chicago, Illinois. April weather in Chicago can bring grown men to tears, especially if you happen to make your living trying to make baseball pictures. The occasional warm, sunny April day is usually outnumbered by more cold, dark and wet days than I care to count. And those days mean only one thing. Dugout heaters! Man, I just hate dugout heaters!! An unfortunate way of everyday life in many northern climate ballparks, they create havoc not unlike the mysterious heat waves of Camelback Ranch! Forget sharp focus. Scratch that, forget focus, period! If there isn’t a bit of a breeze blowing back in toward the dugout, you’re basically screwed. The heatwaves these dugout heaters kick out make shooting batters on cold days a crap shoot at best. Occasionally, one frame out of a sequence might pop into focus. For old timers who shot film, remember what happened if you accidentally got some grease on a slide or negative? You get the same effect from images effected by dugout heaters. Garbage. Junk. Trash. Delete all. For those who shoot baseball regularly on the west coast, count your blessings. You probably have never even seen a dugout heater. Trust me, you don’t want to. Even though the dugout heaters were on a Wrigley Field this day, I encountered no heat wave related issues since a strong, steady breeze was blowing in toward the dugouts. Here, the Cubs Tyler Colvin launches a two-run home run in the third inning against the Arizona Diamondbacks. Shooting out toward the pitchers mound or infield is typically fine since these dugout generated heatwaves don’t generally drift out far enough to interfere. But shooting batters? Unless you get lucky and that much hoped for breeze is blowing nice and steady, you can forget it. I got lucky at Wrigley on the 5th since there was a strong breeze blowing in from Lake Michigan that kept the heatwaves bottled up in the dugout. The breeze might have kept the temperatures a bit chilly, but that’s OK with me. One game in the bag. Now it was on to Opening Day on the Southside! As I am every Opening Day, I was amped up for our Opener against the Tampa Bay Rays. For me, it’s like, “ready or not, here we go” as the roller coaster ride that is the regular season begins its wild journey. Hang on tight! Once again this year, WGN-TV’s morning show requested to have me be a guest as part of their Opening Day broadcast. I was featured on the 8:45am segment filmed live from the newly opened bar and grill across the street from U.S. Cellular Field, Bacardi at the Park. This year, the focus was on some of my behind the scenes images. Those live for TV spots go so quick. Just as I felt warmed up, it was over, so back to the ballpark I went to prepare for my day. Kudos to my fellow staffers who show up at 3:30 am every Opening Day to coordinate the morning broadcast schedule. Nice job, Marty! Really! I never know what surprises are in store Opening Day. This year, I had a fun little behind the scenes assignment to document a visit to the White Sox clubhouse by Chicago Mayor-elect Rahm Emanuel as he visited Ozzie and company prior to the game. 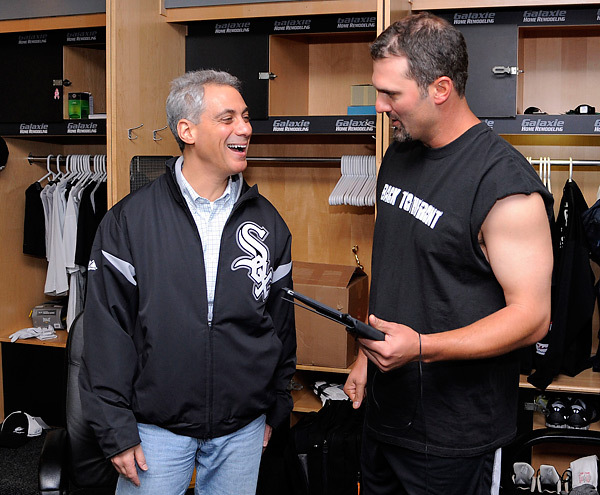 Chicago Mayor elect Rahm Emanuel shares a laugh with Paul Konerko during a visit to the White Sox clubhouse prior to the Opening Day game against the Tampa Bay Rays on April 07, 2011 at U.S. Cellular Field in Chicago, Illinois. The game? Well, the weather was incredibly lousy! There was a thick fog that reminded me more of covering a Giants game at Candlestick Park than here in Chicago. Cold, foggy and dark. Well, my grand vision of making beautiful full-house feature images of The Cell went by the wayside as the fog failed to lift by game time as predicted. Mark Buehrle #56 of the Chicago White Sox is greeted by teammates during Opening Day ceremonies prior to the game between the Chicago White Sox and Tampa Bay Rays on April 07, 2011 at U.S. Cellular Field in Chicago, Illinois. The White Sox defeated the Rays 5-1. Fans bundled up in winter jackets don’t really convey the summery baseball feel that we like to promote, so that project was shelved too. What a difference as compared to last years home opener! 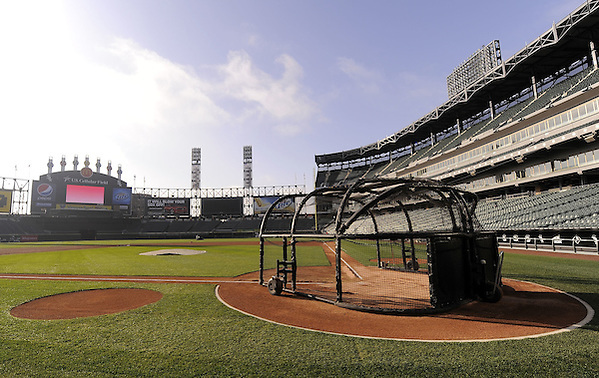 An early morning view of U.S. Cellular Field prior to the 2010 home opener. What a difference a year makes! Regardless of how miserable the weather was, Opening Day IS Opening Day, so I covered the ceremonies like I normally would, hoping that someway, somehow, I could make a few images that looked better than the day proved to be. 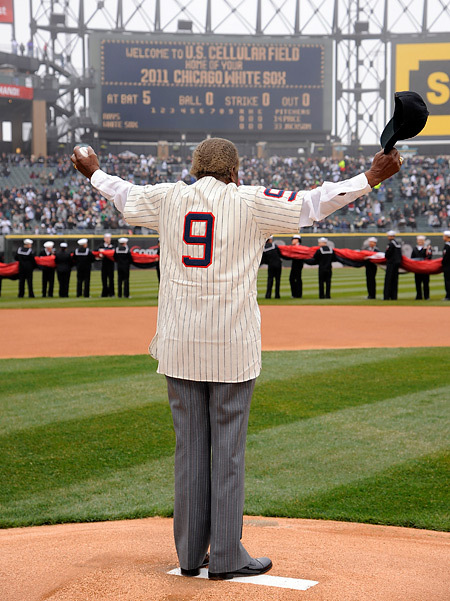 White Sox legend Minnie Minoso #9 of the Chicago White Sox is introduced during Opening Day ceremonies prior to the game between the Chicago White Sox and Tampa Bay Rays on April 07, 2011 at U.S. Cellular Field in Chicago, Illinois. The White Sox opened their 2011 home schedule with a ten game homestand which seemed fairly unusual to start the season. More importantly to me, six of those ten games were day games, accounting for nearly 25% of the total amount of days games played at home by the White Sox for the entire season. 25% of our day games, done and gone after the first homestand! Please play nice, Mother Nature! You know I need great weather for ALL those day games, right? But as I previously mentioned, Chicago weather in April is quite fickle and can pull the rug right out from under any plans to make “hay while the sun shines”. Luckily, the weather didn’t disappoint. Well, at least for one day. Summer arrived early April 10th as sunny skies and 87 degree temperatures warmed The Cell for the Sunday series finale versus the Rays. No dugout heaters!!! Yes!!! I felt like I just won the lottery, wishing I could shoot 8 games that day instead of one. I knew it wouldn’t last, and sure enough, it didn’t. 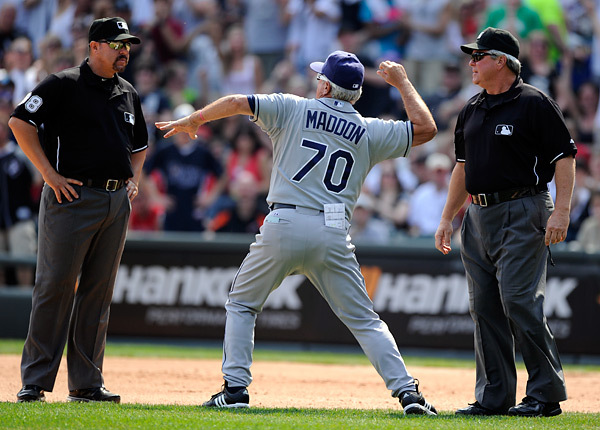 Tampa Bay manager Joe Maddon put on an animated display after a call at first base was reversed by the umpiring crew April 10th. With the Ray’s scuffling at the time, I imagine Joe did what he had to to ignite his team to try and get them back on track (which they did, actually, rebounding back to over .500 as of this writing). It reminded me of when Lou Piniella and Mark Wegner had words at Wrigley back in 2007. Nice show, Joe! Early in the season, while making fresh images of all our players, I also concentrate on our new acquisitions, particularly Adam Dunn. In an recent blog I chronicled just how difficult it is to make a nice action picture of Adam, and my hope to continue the quest for Adam Dunn greatness in pictures was temporarily squashed when he underwent an emergency appendectomy prior to the home opener. Right off the bat, I lost three day games minimum. The Dunnless White Sox would play on and all I could hope for was a change of fortune later in the homestand. Dunn eventually made is home debut April 12th against the A’s, but Alexei Ramirez stole the show this night by hitting two home runs including a walk-off game winning home run in the 10th inning. Sweet moment, sweet swing, sweet image. Alexei Ramirez #10 of the Chicago White Sox hits a walk-off game winning home run off of Bobby Cramer #26 of the Oakland Athletics in the 10th inning on April 12 00, 2011 at U.S. Cellular Field in Chicago, Illinois. Ramirez hit two home runs on the night. The White Sox defeated the Athletics 6-5. Alexei’s reaction was quite similar to his grand slam home run during the final regular season game of the 2008 season that vaulted the White Sox into their AL Central one-game winner take all contest with the Twins the next day. All was looking good this night. Alexei Ramirez #10 of the Chicago White Sox is mobbed by teammates at home plate after hitting a walk-off game winning home run off of Bobby Cramer #26 of the Oakland Athletics in the 10th inning on April 12 00, 2011 at U.S. Cellular Field in Chicago, Illinois. The White Sox defeated the Athletics 6-5. The weather and the White Sox’s fortunes took a turn for the worse following their exciting winner on the 12th. Thankfully, baseball is a long season and I’m sure the ship will be righted soon. So what was the silver lining from within this dark cloud? Pitchers. Lots of pitchers. This lack of good fortune provided me with a chance to stock up on file images of our staff. 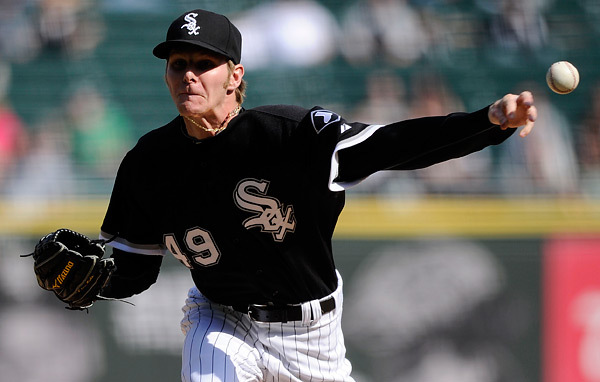 Lefty Chris Sale pitches against the Oakland Athletics on April 13, 2011 at U.S. Cellular Field in Chicago, Illinois. Experience tells me to take advantage of this opportunity, no matter what time of the season it is. Especially since as I noted earlier that this 10 game stretch dished up nearly 25% of our home day games for 2011! A parade of pitchers during day games with nice light? Jackpot. Even though the end result on the field wasn’t what I would have liked, in reality I need to make pictures on these guys, especially from an an angle near or from behind home plate. So why not knock out some pitchers pic’s early in the year and make lemonade out of lemons, right? 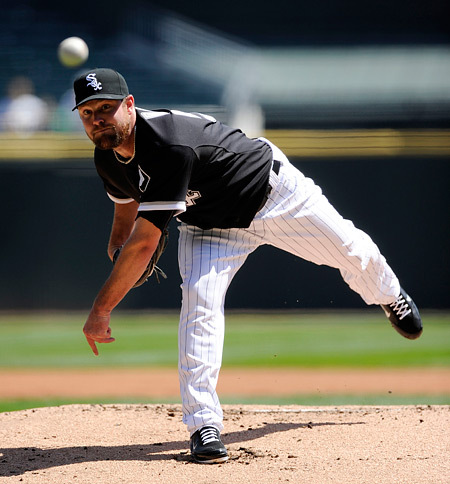 A view from behind home plate as John Danks pitches against the Oakland Athletics on April 13, 2011 at U.S. Cellular Field in Chicago, Illinois. 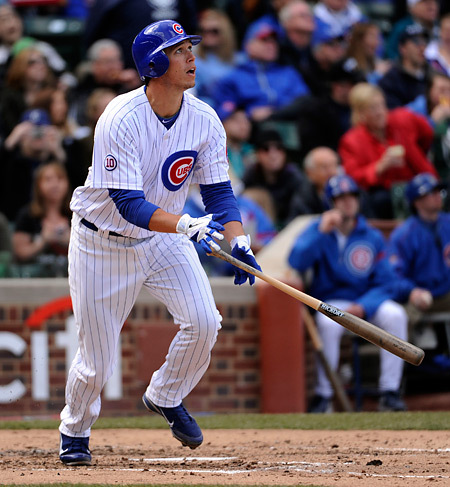 With the bats cooling off toward the end of the homestand, batting pictures naturally became difficult to come by. Time to look toward the field for action. This sequence of Gordon Beckham getting upended by Peter Bourjos of the Los Angeles Angels while turning a double play was one of the defensive highlights. Gordon Beckham #15 of the Chicago White Sox turns a double play after being upended by Peter Bourjos #25 of the Los Angeles Angels of Anaheim in the fifth inning on April 17, 2011 at U.S. Cellular Field in Chicago, Illinois. Looking at this sequence, I couldn’t help but think Bourjos ventured just a little bit out of the baseline to take Gordon out. Players have good memories. 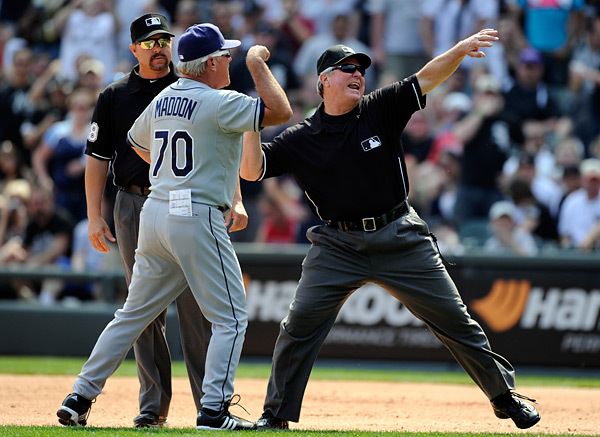 Thins might get interesting next time the White Sox and Angels get together, don’t you think? The White Sox ran into a pitching buzz saw, having to deal with the one-two punch of undefeated pitchers Jared Weaver and Dan Haren, separated by Angels rookie hurler Tyler Chatwood, as the homestand came to a close. 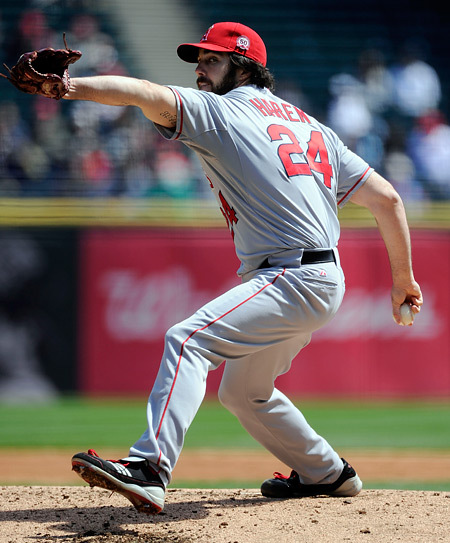 Los Angeles Angels pitcher Dan Haren earned his fourth victory of the 2011 season by defeating the Chicago White Sox 4-2 on April 17, 2011 at U.S. Cellular Field in Chicago, Illinois. This week the plan was to spend a few days catching upon on editing (which I accomplished prior to penning this blog) before venturing out to Wrigley Field Friday to cover the Dodgers and Cubs. Saturday morning it will be time to hop on a Southwest flight and head for Minneapolis, destination Target Field, to cover the red hot Cleveland Indians as they visit the Joe Mauer-less Twins. This entry was posted on Thursday, April 21st, 2011 at 10:28 AM	and is filed under Chicago White Sox. You can follow any responses to this entry through the RSS 2.0 feed. I always look forward to your posts Ron! Great photos as usual. I would love for you to make a blog post about workflow. I also dread digging through all the shots of a game and editing them up to make them look their best. It’s very time consuming, so any shortcuts or best practices would be great to hear from you. I love that you say Opening Day should be a national holiday because I say the exact same thing every year! Nice angle and shot of Thome’s #590, Ben. Stay dry tonight!! Hope the rain is gone by Saturday morning. Plenty to deal with in Chicago today. Ron, I hope you enjoyed the games at Target Field this weekend. Great weather on Sunday! Too bad (for me) Friday’s game got rained out. I thought we were going to see Thome hit #592 on Sunday in his first at-bat (and his second too actually). Just off the top of the wall. If you get the chance, I’d love to see some of the photos you got this weekend. I hope you get a chance to come back to Target Field this summer, perhaps when the White Sox are in town. I’ve got front row seats to a lot of games this summer at Target Field, so I’ll be photographing a lot of games (I’m actually using a Nikon 300mm f/2.8 VRII this season, so I should get some good shots considering I don’t have media access). Ben, sorry to hear about your rain out on Friday. The weather cooperated for the most part this weekend, especially Sunday. Watching Jim hit that long single early in Sunday’s game reminded me of a game where I witnessed Frank “Hondo” Howard crushing a drive off the centerfield wall at old Comiskey Park (then about 440 feet from home) only to barely make it into second base with a long double. I thought Jim had #592 too! Pictures from the weekend will eventually be uploaded into my archive. Just use the quick search via Gallery Collections option in the upper right hand corner to find them. I plan on visiting again when the Blue Jays come in for a visit. Great to hear you’ll be coming back to Target Field and those Blue Jays games aren’t too far away either. Actually, for all 3 of those games I’ll be sitting front row right next to first base. Should be a lot of fun, hopefully the weather cooperates. Just curious since you often shoot on behalf of MLB, do you know if MLB will be doing specific photographic coverage of Thome say when he gets to #599? I wasn’t sure if reaching #600 would get special attention or not in terms of photography by MLB and if you would be involved in any way. I’m really crossing my fingers that Thome does it at Target Field. That will really be something to remember as a baseball fan in general.